craftsmanship & friendly services are judged by our customers. trophy shop & pick something. Have a pleasant shopping trip & a refreshing experience. Tim and the team have always provided excellent service and products. Very helpful and easy to deal with they have helped make our events a success. WHO WE ARE. We are a second generation family owned and operated business for 32 years. We strive to build strong and long lasting customer relationships. OUR GOALS. Our goal is to help you recognise your top performers, or give thanks for a special contribution. Presenting a beautiful award tailored to suit the recipient makes it that much more special to them. HOW WE DO IT. We always work closely with our customers to ensure the best service. From choosing or designing a trophy, through to the artwork, proofing and delivery on time. Specialists in corporate and custom trophies, we have an experienced team who will work with you to ensure your presentation will be a success. We can source a wide range of trophies and plaques to suit your branding and values, or create a custom design to really stand out. 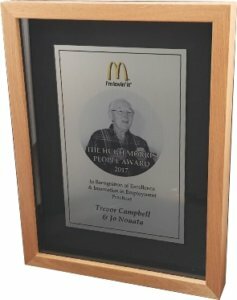 We employ qualified graphic designers and the latest engraving techniques to personalise your awards. Experienced in working on large conferences and deadlines, we understand the importance of delivering on our promises and on time. Our combined team has over 50 years experience in the industry. Being able to provide the best recognition product as well as service to suit your needs. We measure our success on repeat business and seek to develop long term relationships with our clients. If you would like a quote or have any questions please fill out the form below and we will be in touch.